Running numbers: 7800 - 7829. 1950 (7820 - 7829) to lot number 377. The 'Manor' class of locomotives were designed as a lighter version of the 'Grange' class and for this purpose a new number 14 lightweight boiler was introduced. Initially, the superheating surface was 190 square feet but this was reduced to 182.3 square feet when the elements were shortened. Like the 'Granges', the 'Manors' used reconditioned parts from the 43XX Moguls but just on first batch of twenty. These parts came from numbers 4302/ 7/ 12/ 16/ 19/ 21/ 22/ 25/ 42/ 43/ 49/ 55/ 60/ 69/ 79/ 82/ 89/ 99, 8301/ 63. The last ten engines of the class did not use reconditioned parts. The power classification of the 'Manor' class was 5-MT, the G.W.R. power class was D and the route availability was BLUE. Modifications to the blastpipe and firebars in 1952 gave a greatly improved performance, while experiments with the smokebox on No. 7818 led to improved steaming. Modifications also included reducing the blastpipe jumper ring and the nozzle diameter from 5 and 1/8 inches to 4 and 5/8 inches and together these alterations increased the steam rate from 10,000 pounds per hour to 20,400 pounds per hour. 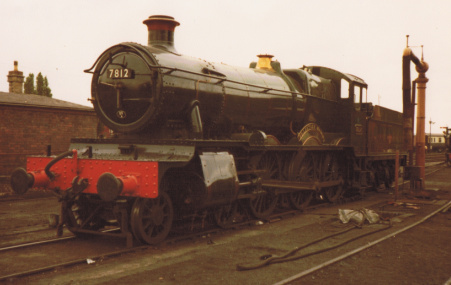 Amazingly from a class of just 30 locomotives, 9 'Manor' class engines were saved for preservation and these are numbers 7802, 7808, 7812, 7819, 7820, 7821, 7822, 7827 and 7828.